The purpose of the Wakefield Joint Strategic Needs Assessment (JSNA) is to provide people knowledge and intelligence about the health and wellbeing needs of the people with the Wakefield District. The JSNA is a Joint responsibility of Wakefield Metropolitan District Council and NHS Wakefield Clinical Commissioning Group. 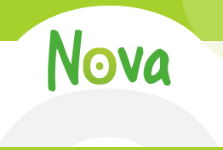 The main aim of the JSNA is to support people, partners and organisation with knowledge and intelligence to make informed decisions in order to improve the health and wellbeing of Wakefield District. What Shapes Health and Wellbeing? Life expectancy has been rising – data for 2016 shows that based on current mortality rates, a baby born in Wakefield District today would live on average 78 years (male) or 82 years (female). For males this is 1.5 years less than the national average values, and 1.1 years less for females. 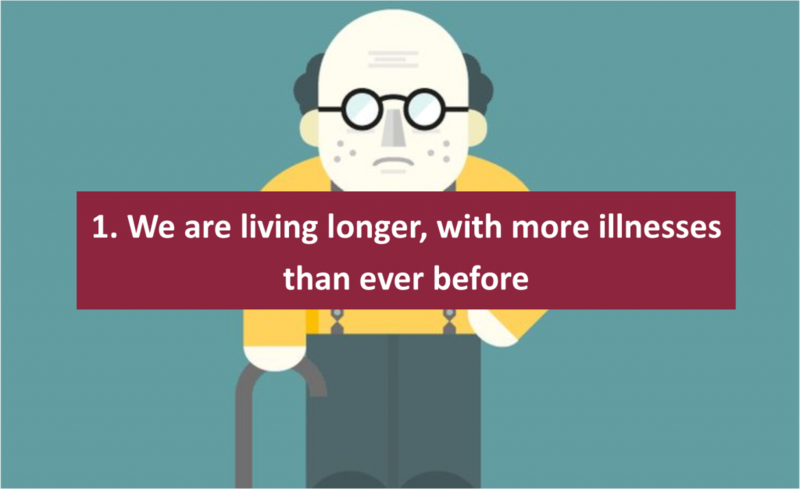 It’s great that we are living longer, but the stats show that we are spending much of the extra time suffering with poor health – around 16 years of ill health for men and 19 for women. In Wakefield males have over 10 years living with a disability and for females this is over 13 years. Without increasing illness prevention activity (e.g. through people consuming less alcohol, quitting smoking and eating well), we face creating greater levels of burden on the health and care system than we are already witnessing. As a health and care system we need to look holistically, viewing wider issues that affect our health such as jobs, housing and our food environment to help reduce the impact on health and care. Wakefield’s biggest killers are cancer and cardiovascular diseases. The rates of death have seen great reductions since 2001 – nearly halving. 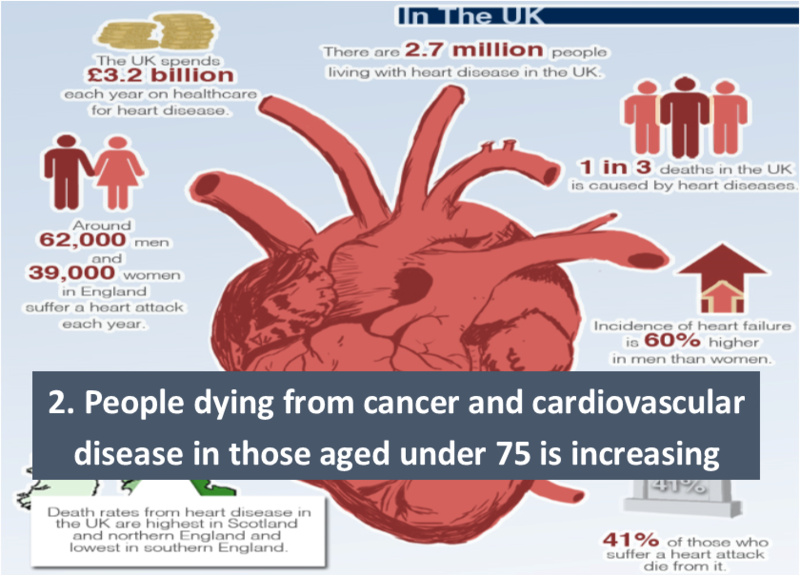 In the most recent 3 periods available, trends show that both cancer and cardiovascular disease in those aged under 75 is increasing in Wakefield. During the same period, death rates from dementia and Alzheimer’s have increased by 60% in males and have doubled in females, partly due to our ageing population and greater awareness of dementia. There is more information available on deaths in Wakefield here. As well as looking at causes of death (‘mortality’) the report also looks at major causes of illness (‘morbidity’). You might be surprised to learn that the biggest causes of morbidity in England are low back and neck pain followed by skin diseases, with depression in third place. 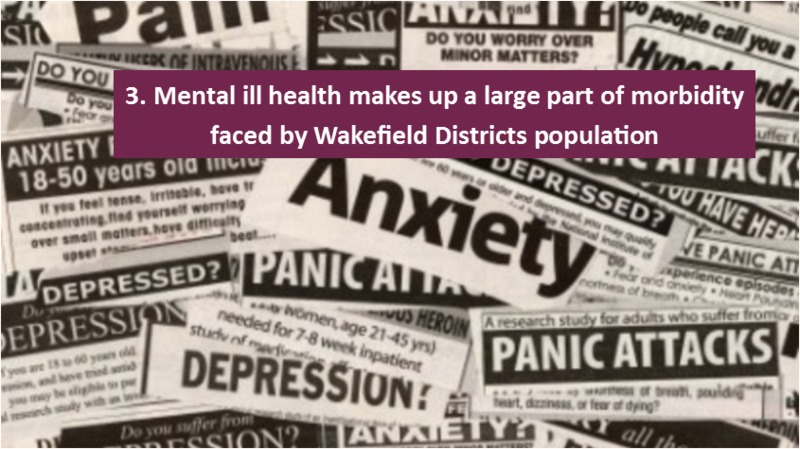 Wakefield has seen a significant rise over the last 5 years in those who are off work due to ill mental health. Along with mental health, poor musculoskeletal health (like back and neck pain) accounts for the majority of sickness absence in the UK, making this an issue of concern beyond the health sector. Self harm in young people is of particular concern in Wakefield District where significant rises have been seen over the last 10 years. There’s a strong link between wealth and health. Men living in the most deprived areas in England can expect to live 9 fewer years compared to men in the least deprived areas – females can expect to live 7 fewer years. Wakefield ranks poorly for life expectancy in men and women across the district, 299 and 290 respectively. They have consistently been in this order for the 10 year period available. The rank is for each district in England and Wales which divides the country in to 346 districts, where a rank of 1 is the best. Both men and women living in the most deprived areas can also expect to spend nearly 20 fewer years in good health compared with those in the least deprived areas. 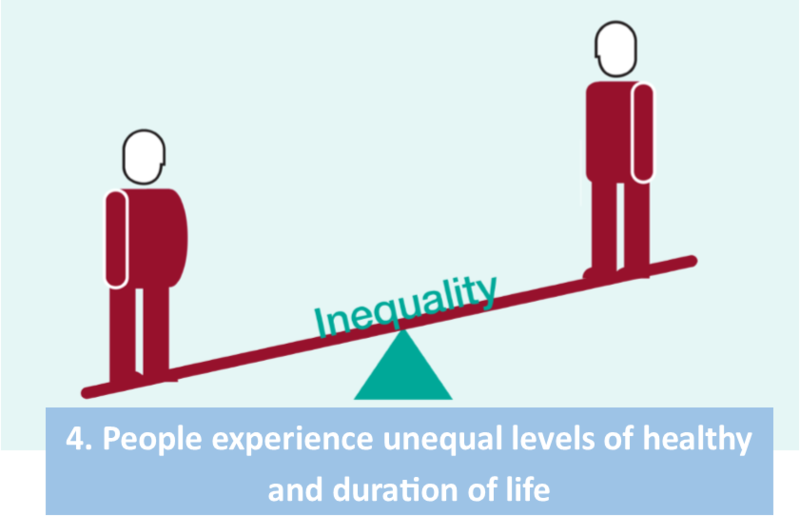 Some people in deprived areas are spending nearly a third of their lives in poor health. It goes without saying that smoking, having a poor diet and not getting enough exercise are key risk factors for a range of serious diseases. 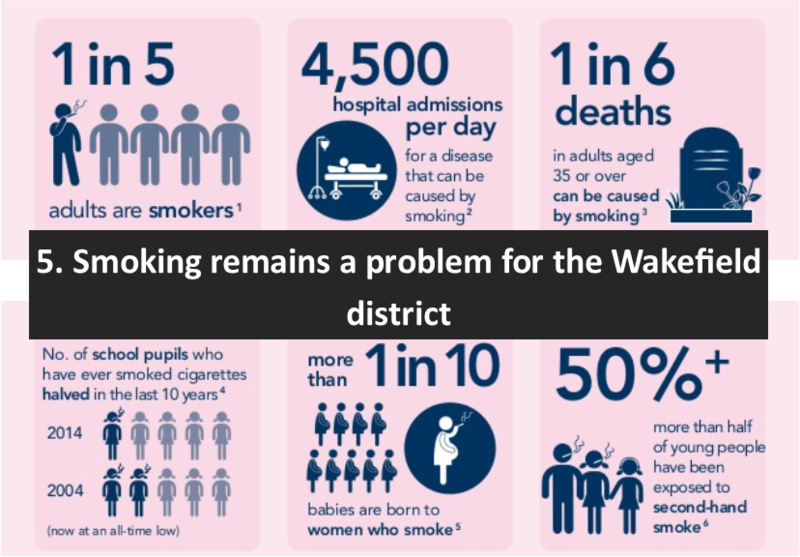 Smoking is still the leading cause of preventable ill health in our nation and locally in Wakefield. The national infographic above shows the smoking burden still across our nation. Wakefield has alarming level of mothers who smoke at time of delivery, 1 in 5 as a whole and in certain communities this is 1 in 3. Increasing the levels of quitters across the district would have positive impacts on the level of premature mortality mentioned above from cancer and cardiovascular disease. The increasing levels of excess weight in the population is well known issue. 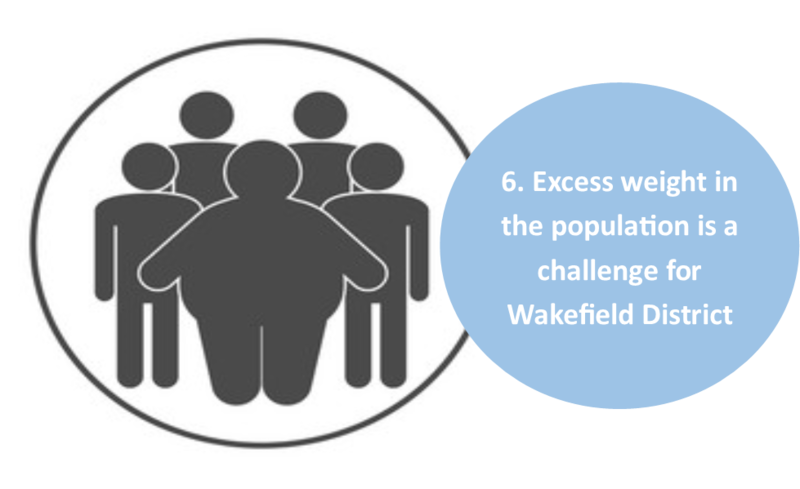 Wakefield has over 70% of the adult population with excess weight. Next to smoking, excess weight has the greatest impact on population health. Wakefield District has lower levels of consumption of fruits and vegetables, which combined with a high density of fast food outlets demonstrates the need for an improved diet to help tackle obesity locally. In poorer areas the prevalence of inactivity and smoking are both highest, while the proportion of people eating the recommended 5-a-day of fruits and vegetables is the lowest. Alcohol consumption across England is increasing, and unsafe levels of consumption are highest in middle aged adults. Consumption in the young shows a decreasing trend for the first time in decades. Wakefield has mirrored this trend, with decreasing level of alcohol related harm in the under 18 and increasing levels in the adult population. Health conditions that are due to or closely related to alcohol are at the highest levels seen for some time in Wakefield – nearly 3,000 admissions of this type occurred last year. Mortality for alcoholic liver disease has also increased greatly in recent times. Related to this is the number of violent crimes that occur both nationally and locally. This is a rising trend and the consequence of this, injuries caused deliberately, are rising for our area too. Long-term exposure to particulate air pollution is linked to thousands of deaths nationally, particularly from heart or lung disease. Wakefield has a longstanding high rate of deaths from these diseases, due to the industries that were prevalent in the district and high smoking levels. Recent evidence has shown how particulate matter is damaging our health. Particularly, older people, the very young, and people with existing heart and lung conditions are more vulnerable to the effects of air pollution. Wakefield District has multiple major traffic routes spanning it in differing directions and some heavy industry remaining, which provides multiple sources of air pollution to continue to impact health in the population. 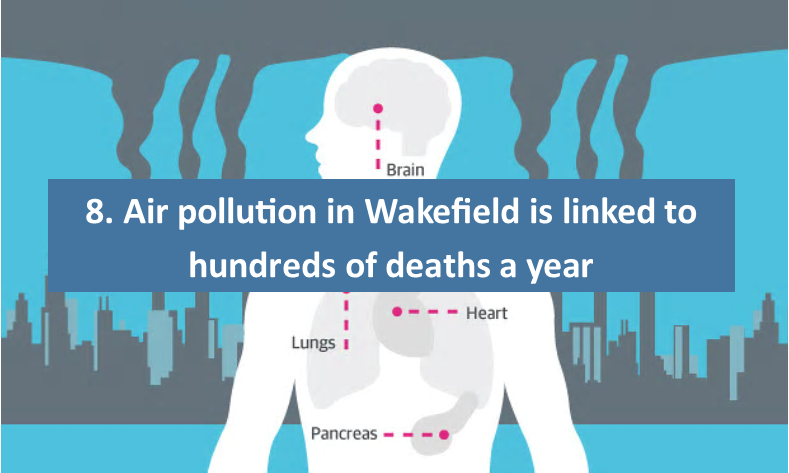 It is estimated that air pollution kills over 15o people in Wakefield district each year. In 1901, around one third of deaths were due to an infectious disease, but thankfully our modern public health system, vaccines and antibiotics have revolutionised the way we protect ourselves from infections. Now, just 8% of all deaths in England are from infectious disease. Flu poses the biggest risk to the population and accounts for much of the 8% of deaths. The elderly and those with long terms conditions are particularly vulnerable to the flu virus. Wakefield districts uptake in the flu vaccine could be improved, preventing these complications in the vulnerable. Infectious diseases such as Tuberculosis (TB) which are more of an issues in other districts, are low for Wakefield but regular monitoring to ensure that a large scale outbreak locally does not happen. Work to reduce the volumes of antibiotics that are used appropriately, to try and reduce antimicrobial resistance is another issues for England and Wakefield alike. Consumption of antibiotics fell across all healthcare settings for the first time in 2014/15. Oral health in Wakefield is worse when compared to the national average. Over time things have become worse in the district with children’s dental health deteriorating and causing more hospital admissions for extraction of teeth. Diet, hygiene, exposure to smoking and several other factors have negative effects on oral health, resulting in tooth lost and other diseases. 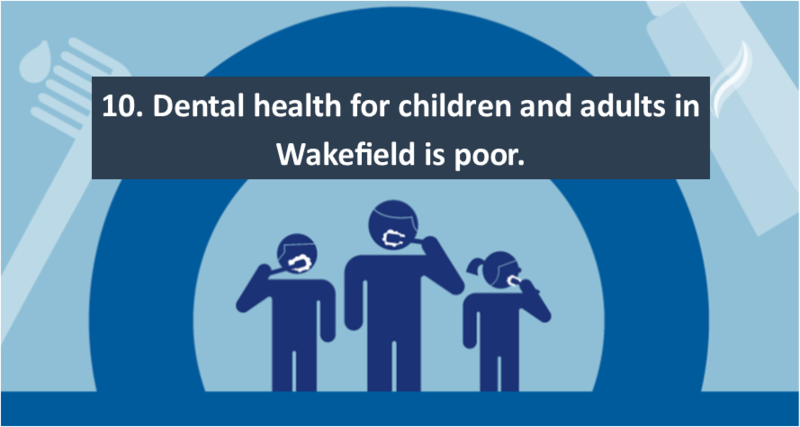 Wakefield as mentioned earlier is a negative outlier for the factors, so is of no surprise that oral health is poor in the district.